Enjoy the taste of summer with our LOVE® brand Premium Valencia Oranges from Pearson Ranch! These Valencia Oranges are tangy and sweet and filled with delicious juice. Not only high in nutrition and Vitamin C, they will be high on your list of foods perfect for the days filled with sunshine. Easy to pack in a picnic basket, back pack, or even ice chest, you can take your Valencia Oranges everywhere your summer adventures take you...hiking, camping, the park, or even to the beach! And like everything else from Pearson Ranch, these oranges come with our 100% satisfaction guarantee. So go ahead, order a 10 pound box of sunshine and we will have them shipped right to your door. This year, why not treat yourself or someone special to a "Summer of LOVE"! Something special about Valencia Oranges...Did you know that in the summer months perfectly ripe Valencias Oranges, while still hanging on the tree can start to once again show shades of green color? In the world of citrus farming it is called "re-greening". Simply stated, the warm daytime temperatures may cause reabsorption of chlorophyll back into the skin of the orange, causing the partial green color to occur. However, rest assured, in no way does it affect the deliciously sweet, tangy flavor of Valencias. Also, in case you're wondering... Yes, some Valencia Oranges do contain seeds. >>For more information on our shipping policies, please see our shipping policies page. For more information please call 1-888-667-2643 (Monday-Friday 8:00a-5:00p PACIFIC TIME). 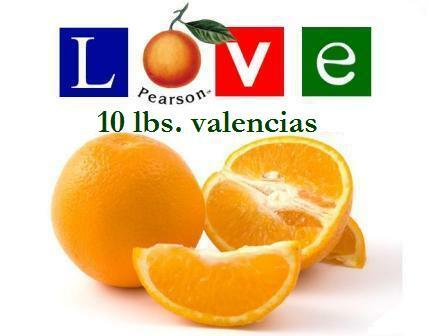 Love® Premium Valencia Oranges 10 lbs.